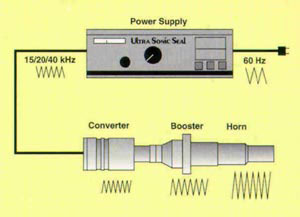 The basic principle of ultrasonic assembly is the conversion of standard 50/60 Hz power to 15 kHz, 20 kHz or 40 kHz. This electrical energy travels through a piezoelectric converter. The converter, typically lead zirconate titanate, expands and contracts at the same frequency, converting the electrical energy into high frequency mechanical vibration. This vibration is amplified by a booster and transferred to the workpiece through a shaped tool, or horn, in the form of reciprocating longitudinal motion. Parts being assembled are clamped together under moderate pressure, at which point ultrasonic vibrations force the parts to impact against each other at a preset frequency creating a molecular bond equal to or above the material strength of the parts. Infinite and accurate combinations of weld time, distance and energy, established through a microprocessor, provide repeatable control of the process, and lend to the full automation of the assembly. Statistical process control and reporting are also possible with some models. WHEN would you use an ultrasonic assembly process? The most common application is the assembly of two injection molded thermoplastic parts. Ideally they should be of the same resins but in some cases dissimilar resins can also be bonded together. They can be either welded together using a variety of joint designs or they can be spot welded. Ultrasonics is not limited to only thermoplastic materials. An ultrasonic assembly process can also be used to install threaded brass inserts into molded plastic bosses; stake plastic bosses over metal plates or printed circuit boards; swage over standing walls to entrap another component; perform continuous line seals on thin films and fabrics; seal the ends of collapsible squeeze tubes; accomplish perimeter seals on clam shell packages; spot weld corrugated plastic sheets in the manufacture of boxes; and much more. WHERE would you use ultrasonic assembly? Simply put, wherever two parts come together and one of them happens to be a thermo plastic resin. Following is a partial list of some of the industries we serve and the typical applications for our process. Appliance: Fixtures, hardware, and enclosure assembly, welding of components. Automotive: Parts and body components, instrument panels, headlight assemblies, under hood assemblies. Cosmetic: Assembly of compacts and other containers, sealing tubes, packaging. Electronic/Electrical: Component, connector cable and wire harness assemblies, enclosure cases and instrument faces, audio/video cassette and cartridge, switch assemblies. Food: Sealing of pouches, tray containers and fillable tubes; sealing microwavable containers; product packaging. Hardware: Product assembly and blister pack packaging. Health Care: Product containers and accessories. Instrument: Welding and staking case assemblies and face covers. Medical: Sterile package sealing; equipment component assembly; syringes and filters. Packaging: Welding extruded plastic sheet for boxes/containers, package sealing. Textile: Fabric slitting, joining or embossing. Toy and Game: Assembly of game elements and product packaging. If you are not sure whether your application is suited for ultrasonic assembly, please rely on us. We are here to help you. Our applications lab is staffed with highly trained ultrasonic specialists whom you can call at any time for advice or information. They will evaluate your applications from parts, prototypes or blueprints, and provide you with prompt and knowledgeable recommendations. This no-cost, no obligation service includes feasibility engineering studies, design recommendations, and material guidance much more. WHY would you use ultrasonic assembly? Because it is the fastest, most repeatable and economical assembly method available to the industry today. With ultrasonics, most thermoplastics can be assembled without heat, mechanical fasteners, or hazardous consumables such as adhesives or solvents. It can join parts - small or large, simple or complex - with lower reject rates than any other method. Using ultrasonics, labor - both as a skill factor and as a time factor - is significantly reduced. And since the equipment can readily be automated, any non-technical operator can be trained in minutes to produce high volume, high integrity assemblies.